Creamy Spinach and Artichoke Hummus. You won’t be able to stop at one bite! My name is Aimee and I have a hummus addiction. I know, it could be worse! I make my own hummus at least once a week…in addition to buying a tub of hummus each week (yes, a total of two containers per week). Because inevitably I run out of homemade and I need a quick fix. 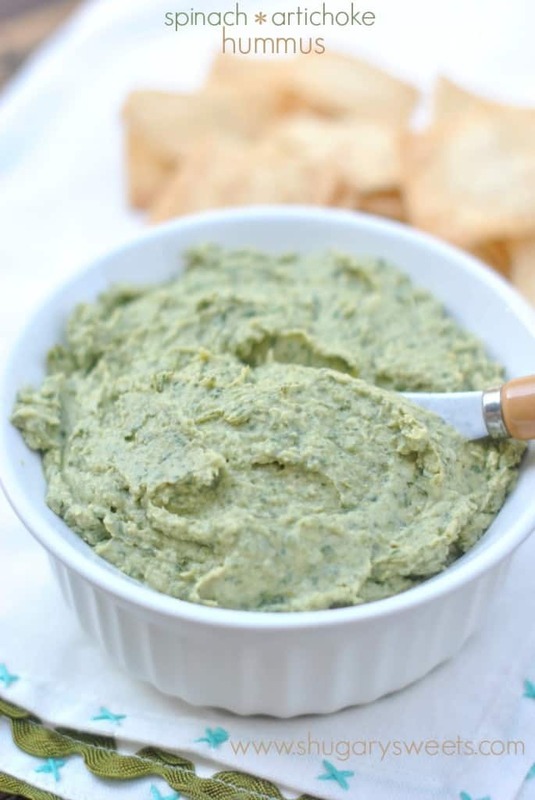 One of my favorite dips would have to be Spinach Artichoke dip. Hot, garlicky and delicious! (hmmm, just realized I don’t have my recipe for that on the blog yet!!) 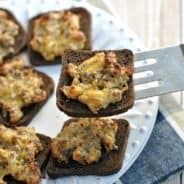 Why not combine my two favorites into one tasty recipe? Spinach and Artichoke, meet your new BFF garbanzo beans. 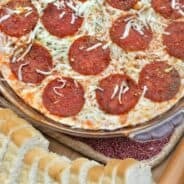 These flavors are incredible together, I hope you give this recipe a try. Use fresh ingredients when possible. For this recipe, fresh spinach, fresh garlic and fresh lemons keep the recipe delicious! Finally, looking to make a pretty impression? Drizzle an extra tablespoon of olive oil on top and add a sprig of parsley on top. Or serve a couple lemon wedges on the side! Now that you know how to make it, ENJOY! It’s a great healthy alternative to chips and dip! Are you following me on Bloglovin’ yet? It’s a great easy way to never miss a post! In a medium skillet, heat olive oil, garlic and spinach for about 3 minutes, stirring frequently, until spinach wilts. Add artichokes and saute an additional minute. Remove from heat and set aside. In a large food processor, process garbanzo beans with tahini and lemon juice until smooth. Add spinach and artichoke, salt and cumin. Process for several minutes until combined and smooth. Add additional liquid (olive oil, lemon juice or garbanzo bean water) if needed to make smoother. ENJOY! Here are a few more delicious snack ideas! 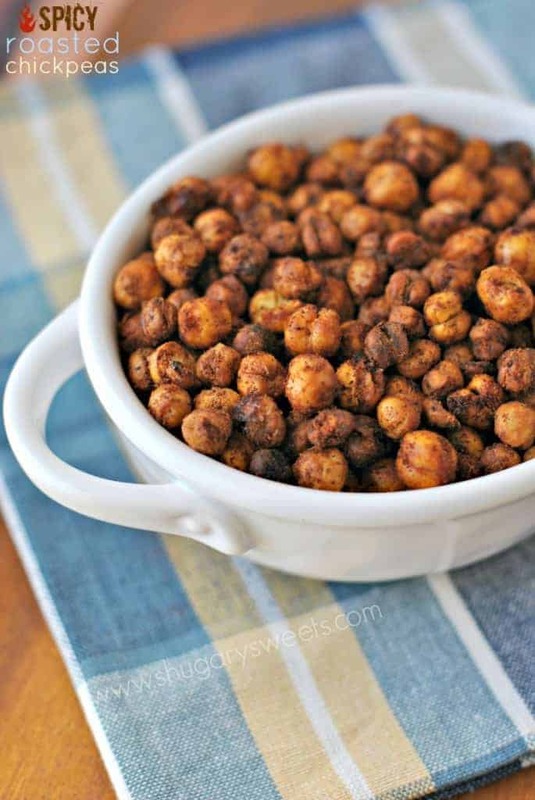 Spicy Roasted Chickpeas: delicious crunchy snack! 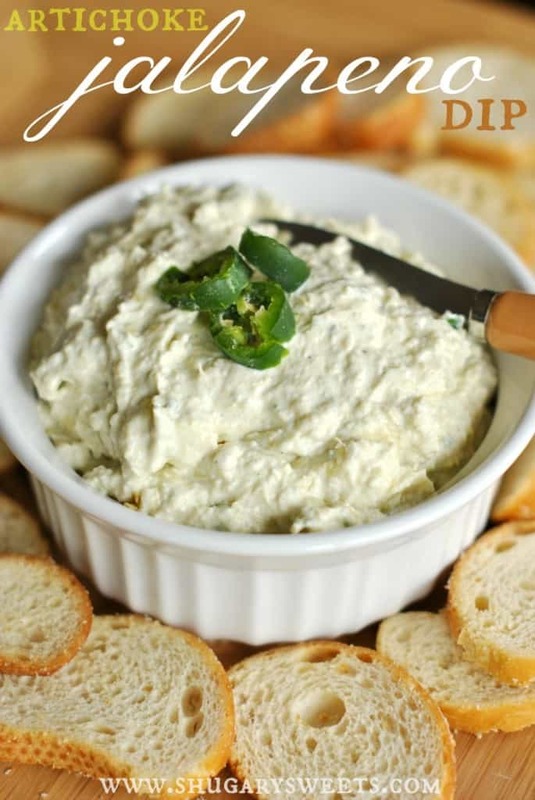 Artichoke Jalapeno dip: a copycat version of my favorite dip from Costco! 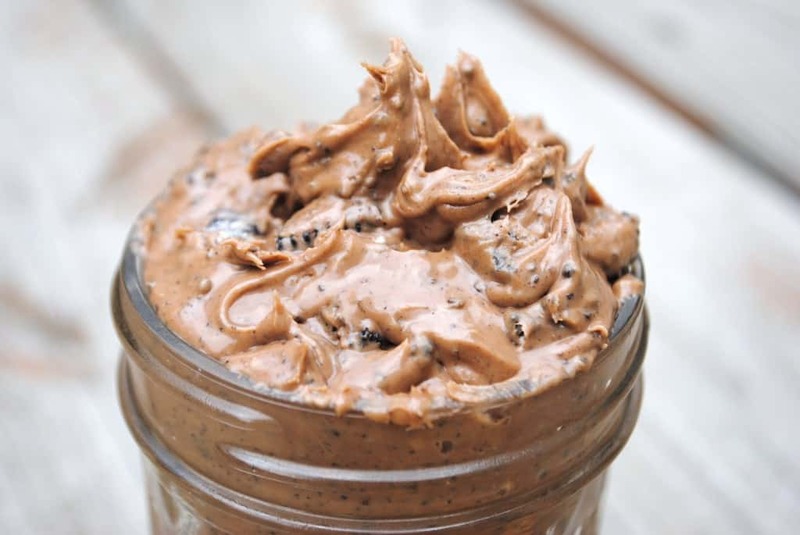 Oreo Peanut Butter Dip: every party needs sweets, try this easy spread and serve with grahams! So I have to wonder, we’re you making this recipe when you told me in OBC that you have your kids pop the chickpeas from their skins to have them occupied with you in the kitchen? I have to teach my 3 year old how to do that. Haha! Oddly enough, I was not making this one, but I’m sure I was making some version of hummus. We make it often and I usually choose one child each week to peel the skins, haha!! What great hummus tips! Can’t wait to give them a try, and try a new flavor, next time I make hummus. Thank you, Aimee! You are quite welcome Megan! This post is a gold mine! All those tips are so helpful! And this recipe – can it be more genius? You combined my two favorite dips. Oh myyyy gosh, this looks crazy good. Cannot wait to try. Love that it is skinny, too! Ok I totally need to try to make my own hummus! I also love hummus and spinach and artichoke dip so this is the perfect marriage. Thanks for the tips for when I get “Brave” and try to make hummus Aimee! LOVE this combo of 2 delicious things! Pinning! Oh gosh. This looks sinfully good! I tried a hummus like this in a local grocery store and have been craving it ever since. So glad now I can make it at home! Yes you can 🙂 ENjoy! Ohhhh Aimee, this looks amazing. I’m so impressed you make your hummus–I buy mine at TJ’s but am as equally obsessed with hummus. I’m definitely thinking I need to try this recipe ASAP! This looks incredible! I should make this for my husband that loves hummus! I’m a hummus addict too! And I love that my kids are fans too-such a great snack! Made this today and was quite pleased–the only thing I screwed up is that I drained the beans and forgot to save the liquid. I made up for it by (as Aimee suggested with a bit of lemon juice, tahini, olive oil and a little water). Delicious!! We never skin our chickpeas when we make hummus. Don’t see the point if the food processor is any good at all. Once you have taken the skins off, you’ll realize how much creamier the hummus tastes, using less oil and liquid! I still occasionally make it with the skins on, but prefer the taste without!! I regularly put artichokes in my hummus, but it had never occurred to me to add spinach as well! Yum! I’m planning to make this as an appetizer on St Patrick’s Day 🙂 As for the skins on the garbanzo beans, I leave them on when I make hummus. 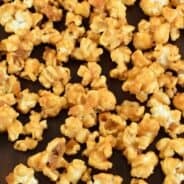 Although I love beans, unmashed/unpureed garbanzos are not my favorites. I’ve tasted a few sans skin before when they randomly fell off while preparing them for hummus, and the texture is definitely improved when they’re gone :)Hummus is already one of my favorite foods, though, and I’m sure it’s amazing without the skins on the beans, but the time/effort plus likely reduction in fiber means I’m not too excited to do it every time. Definitely will have to try it your way once, though! This is a thing of beauty! 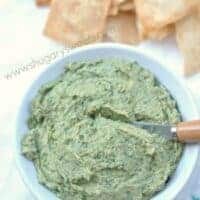 I just love spinach artichoke dip, but adding it into a hummus is brilliant 🙂 yum! Fabulous idea to combine the two! 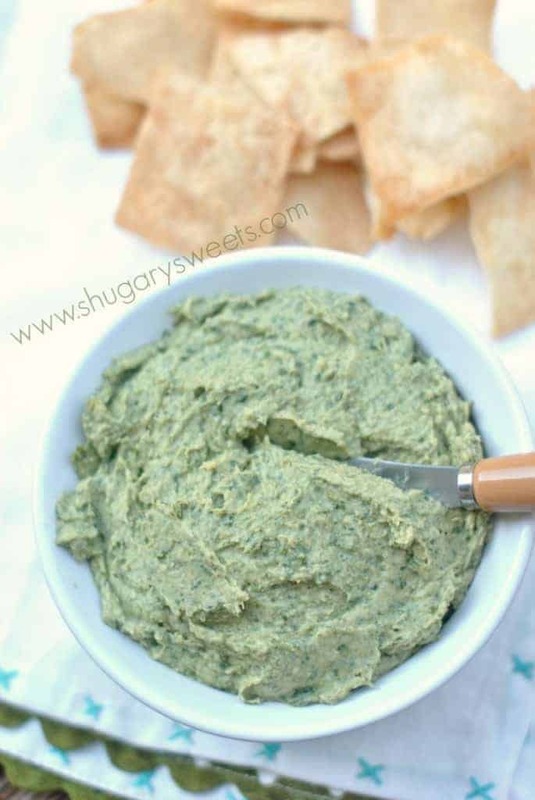 I’m a big fan of hummus and spinach artichoke dip so I’m sure I would love this! how long does this stay for? Would the artichoke hearts be marinated or not?